In contrast to the usual shotgun pattern of exhibition, this weekend features several films that are using a more carefully targeted approach to their release. This isn't to say the weekend is a blockbuster-free zone, but returning films will get a little more breathing space. In what seems to be a horrible focus-group experiment gone wrong, that blockbuster is Scooby-Doo 2: Monsters Unleashed. This is at least the third recent example of the phenomenon I call, "Wait, we green-lit what?," following Scary Movie 3 and Tomb Raider 2, sequels that it's hard to believe anyone was demanding. Though Scooby-Doo opened a stunning $54 million in June of 2002, it limped home to a $153 million total, less than three times the opening weekend, a miserable performance by any standard. "Reviled" doesn't seem to cover its reception and expectations are obviously lower, hence the March debut of the sequel. Support for the original film was largely based on (misplaced) nostalgia, a resource that is not inexhaustible, especially when you give your audience a good reason to question the reason for that nostalgia in the first place. Boomers who grew up on the cartoon made up a huge portion of the audience the first time only to discover that they'd been duped into a film suitable, at best, for an age-12 and under audience. So the whole cast and director and writer (who by an odd twist of fate, is the screenwriter behind the likely top two films at the box office) are all back, but it hardly matters, since the core audience has been alienated and we're looking at this just as one last kick at the pre-teen can. The plot is, well, something to do with more monsters and people running around in terror, but it also has things like Scooby-Doo in an afro doing the Electric Slide. That's funny how? File this away with other sequels that will go down in cinematic infamy, like the follow-ups to Charlie's Angels, Ghostbusters, The Flintstones and (shudder) Caddyshack. It's opening on 3,312 screens but that's more a move of desperation than anything. It should open to about $18 million on brand name alone, but will have an almost laughable short run. It's not every day that you get to see one of the most bankable actors play a deliberately weird, potentially off-putting role. 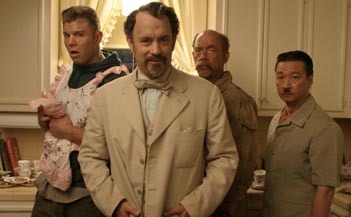 Then again, it's not every day that Tom Hanks works with the Coen Brothers. The Kings of critically acclaimed, strange, mainstream Hollywood films (everyone has to have a niche), the Coens have become quietly prolific of late, with The Ladykillers being their fourth film in four years after taking 14 years to make seven. And, whether it's due to choice, or simply availability, they're beginning to feature a lot of star power in their films. George Clooney had been their go-to guy for a couple of films, but the decision to hire Tom Hanks as a southern gentleman strikes me as positively genius, and that's not even counting the tremendous fun it looks that he's having the role. The Ladykillers is a remake of a 1955 film starring Alec Guinness about a group of criminals who use the cover of an unsuspecting(?) old lady's house to plan a crime and who proves to be more difficult than they thought to "get rid of" when she becomes inconvenient. This film moves the location from London to New Orleans (is tunneling in that city really so wise?) with Hanks' hilariously exaggerated accent carrying a heavy comedy load. The comedy's a bit broader than we're used to seeing from the Coens, though last fall's Intolerable Cruelty also felt like a departure for them, no doubt since, like The Ladykillers, it wasn't based on an original script from them. The vast majority of the success, then, will depend on what Tom Hanks can bring to the screen. It's bound to be a polarizing performance, but it's the kind of thing that a big star can pull off (witness last summer's box office hit-making performance of Johnny Depp in Pirates of the Caribbean). Debuting on a mere 1,583 venues but with a blitzing promotional campaign, it's caught in a middle ground between hit and arthouse. Look for a performance about equal to Intolerable Cruelty, despite the fewer number of screens, or about $12 million. Imagine you're a young director with a cult following and a string of moderately successful films and the actor that you helped to break has become one of the bigger stars in Hollywood. Defying his star status, he's remained loyal to you, and is engaged to one of the hottest actresses in Hollywood and their relationship is the highest profile since Steve McQueen/Ali McGraw. You've easily convinced them to star in your latest film, which will be their second together. You've hit paydirt, right? Now let me just check those grosses on Gigli and... oh dear God, NO! Poor Kevin Smith. The Bennifer saga quickly turned from asset to detriment in selling Jersey Girl and before you can say "Charlie Kaufman," Jennifer Lopez was pretty much wiped from the promotion of the film, Affleck being the star and Lopez having more or less an extended cameo in it. As Miramax scrambles for damage control ("She dies in the first ten minutes! Promise!") it's still not clear sailing, but the seas have calmed. Jersey Girl is based on some of Smith's experiences as a father, adopting Ben Affleck as his alter ego... yeah, I think I see the resemblance there. A definite departure in some sense from his other films (save Chasing Amy), Jersey Girl sees him tackling a more serious tone (interestingly enough, he seems to be moving in the opposite direction as the above example of the Coens). Affleck plays single father Ollie Trinke (just a terrible character name, Kevin, I don't care what comic book it's based on) dealing with love and life and being a parent and all that good stuff. Affleck has had an up and down couple of years, doing well in things like the Jack Ryan role in The Sum of All Fears and opening Daredevil to an impressive $40 million plus, but has also had the whole Gigli mess which was followed up by the mediocre Paycheck. The fact that Paycheck didn't bomb entirely is promising; he'll be forgiven eventually, and maybe being in a Smith film so soon after is the best thing for him. It's a very forgiving and appreciative built-in audience that can be counted on to keep him afloat. There's some question as to whether the same audience that flocked to Jay and Silent Bob Strike Back will follow to more dramatic fare like this, but then it's also not necessarily as insular and alienating as the Askewniverse films can be. Jersey Girl is opening on 1,520 screens, almost half the number on which his last film started, so it's not as if a big hit is expected here. It should open to about $8 million. DMX has left his music career entirely, so he says, to devote himself to acting, where he's made a decent showing as an action star. Never Die Alone is him trying to make his Scarface. Based on a 1974 novel of the same name, the film features the rapper as a recently released crimelord attempting to reclaim his life. After he's slain, the film relates his rise and fall through tapes he's left of his life, which fall to the unfortunately miscasted David Arquette, who is the opposite of "gritty." The film looks slick but is receiving a critical thrashing, with the words "unintentional comedy" rearing their ugly heads. The 1,100 screens on which the film is debuting are a huge hindrance for the film since it's targeted at black audiences and the screens are almost certainly carefully chosen, but cross-over potential seems to be minimized. Don't write off the chance of a new DMX album so soon. Never Die Alone shouldn't flop outright but it's also not going to make him into the next Tupac Shakur. An opening weekend of $7 million is in store here. Dawn of the Dead easily took the top spot for last weekend at $27 million but the question remains about its longetivity. Among the rare critically praised horror films, it's also been pretty well received in the general populace, with few truly negative comments and many positive ones. It's been ages since we've had a genuine leggy horror film, going back to The Ring, which increased in week #2 after a slight expansion. I don't see Dawn of the Dead doing that (for one thing, it already opened as wide as it needed) especially since for a horror film these days, dropping less than 35% practically makes you Titanic. Good word-of-mouth is unpredictable in scope, though, so be on the lookout for a breakthrough. It should stick around at the $15-16 million mark for weekend number two. The Passion of the Christ dropped to the second spot last weekend, although it's continued to be in first place over the course of the week, passing the $300 million milestone on Wednesday and becoming the fourth fastest film in history to do so. Falling into a pretty consistent pattern, we're into the position of waiting to see what effect Easter will have on its box office. Traditionally these kinds of effects are minimal, but so much about The Passion has been unexpected. However, it is falling into a pretty normal blockbuster pattern in the past few weeks. Mel Gibson will get another $12 million to add to his warchest this weekend. Eternal Sunshine of the Spotless Mind found its relentlessly quirky premise a bit much to overcome at the box office, opening to a modest $8 million, or 1/10 of Jim Carrey's last film opening. Despite a very passionate core audience, I feel this film will have trouble catching on. Exhibitors don't seem to disagree, as even though it has room to grow in theaters, almost no expansion is taking place this weekend. Legs for this kind of daring, honest cinema would be appreciated, but also surprising. It should only take about $5 million in this, its second week of release. Several films open in limited release this weekend; the most prominent is Lars von Trier's minimalist and controversial Dogville, which does the LA/NY route in nine venues. Starring Nicole Kidman as a woman on the run in the '30s, the film follows her into a Colorado town that accepts, but is wary of her. As her secret starts to come to life, the darker side of the villagers is also exposed. This promises to be a divisive film, with many calling it an unqualified masterpiece but others calling it pretentious and contrived. Shot almost like a play entirely in sets, it's certainly unlike anything out there right now.